This is a queen size tapestry. 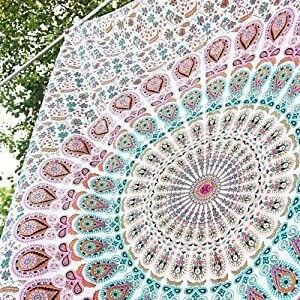 Our Queen size tapestry is 84 x 90 Inches or 220 x 240 CM. 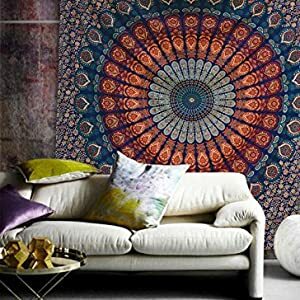 Don’t buy any Tapestry blindly from Any Seller Before Confirmation. world’s best ranked as #2 by Ezvid Wiki in top 10 tapestries! We are very pleased to announce that Bless International tapestry has been ranked as #2 by Ezvid Wiki in 2017’s top 10 tapestries! Compiled with twenty-three hours of research, this newly published Wiki in our decor category is a broad-ranging, impartial assessment of tapestry options available to consumers in the United States. While it might be difficult to move wall paintings from one place to another, tapestries can be transported easily. All you need to do is take them out, roll them and transport. There are no chances of them getting broken or damaged, as in the case of wall paintings. 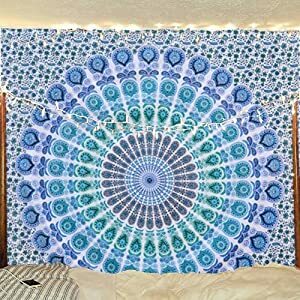 Maintaining tapestries is very easy and can be done by anyone. A soft brush such as a painting brush should help you clean your tapestry. Any stains also can be easily removed by using a gentle fabric cleanser. You can even give it for dry clean without any worries. Cotton and linen tapestries can even be machine-washed. Paintings, on the other hand, may require lot of care when it comes to maintenance. 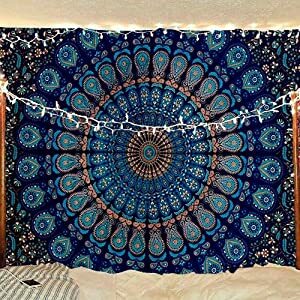 ->Bed Cover, Tapestry, Curtain,Couch cover, Wall Hanging. ->Table Cloth, Furniture cover, Fabric for creativity, Throw covers for Sofas. 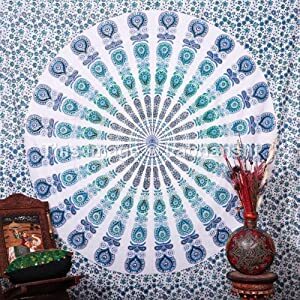 ->Festival/wedding decoration, Restaurant/shop decoration, College/dorm Decoration, Festival flags. 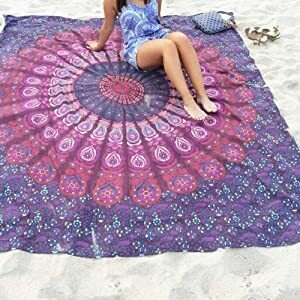 ->Perfect gift for all occasions ->Picnic/Beach Sheet/ Blanket etc. ->Actual Images of items in indirect sunlight are shown above. ->We follow WYSIWYG “What you see is what you get”. 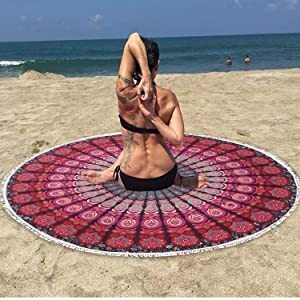 ->As this item is handmade hence, please allow some size variation from mentioned measurement. ->We have tried our best to present the actual picture but there can be differences in colors due to screen resolution, monitor setting, Mobile app use, viewing angle and other photographic elements. Tapestries of the Islamic World were made of cotton and wool. Ever since 14th century, gold and silver weft threads have been used along with silk and wool to give a sumptuous effect to tapestries. These silver threads would be woven on to a silk thread in a spiral. While it might be difficult to move wall paintings from one place to another, tapestries can be transported easily. All you need to do is take them out, roll them and transport. There are no chances of them getting broken or damaged, as in the case of wall paintings. 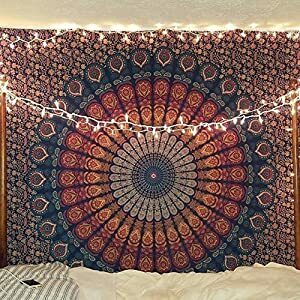 Maintaining tapestries is very easy and can be done by anyone. A soft brush such as a painting brush should help you clean your tapestry. Any stains also can be easily removed by using a gentle fabric cleanser. You can even give it for dry clean without any worries. Cotton and linen tapestries can even be machine-washed. Paintings, on the other hand, may require lot of care when it comes to maintenance. They were designed to decorate large architectural surfaces. Most of the Western Tapestries that were designed in the 18th century were encased safely in woodwork. Most of the earliest European tapestries were a combination of efforts put in by painters, designers and weavers. The weavers would follow the cartoons created by the designers or the painters, carefully. Yet there were times when the weavers would add in their own artistic personalities, making a few departures here and there.